You might be from Chelsea, Oklahoma if….. 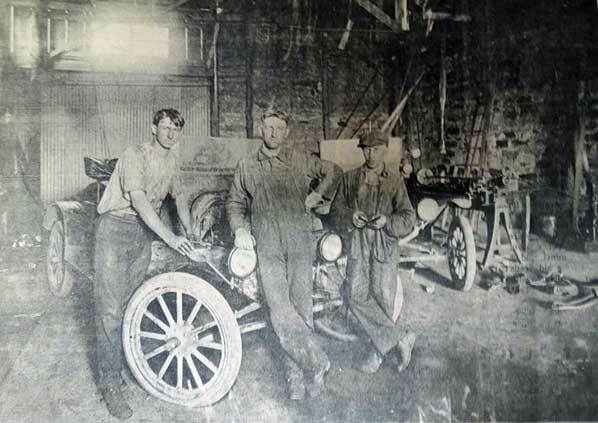 This is a picture of one of Chelsea’s first garages and automobile mechanics, Fred K. Martin, Center. The garage was located in a sand stone building at the corner of Olive and Seventh Street. The building is now razed with only parts of the original rock walls standing. Appropriately enough the rock building came into being as a transportation center…it was first used as a livery stable. Clarence Canady, one of the city’s early horse fanciers, probably operated the first business there. Another tenant was a Mr. Shepherd. “I well remember seeing Mr. Kaff’s hearse in that livery barn. As a little kid I would walk by and see that hearse standing in the back of the barn. Then when there was a funeral, he would use a team of fine black or white horses from the livery stable”, reminisces George Manifee. Mr. Kaff was William Arthur Kaff, one of the city’s first morticians. For years he operated the city’s funeral hoe in conjunction with the Chelsea Hardware & Furniture operated by Arthur S. Lee. The horse-drawn hearse was retired about the time of World War I. The garage was at one time known as the Star Garage. Early business men in that location were Jolly Robinson, S. A. Elliott and George F. Goosmann, who later moved his business to a location at Fifth and Walnut, highway 66. Model-T with lamps mounted at the side of the windshield. The chief mechanic, Martin, grew up in the community and began work as a young man in the local oil fields. Of necessity, he kept the engines of the drilling machines running, so it was only natural that he should also be called on to work on broken down cars. He learned his trade by the simple method of trial and error. And old timers recall that there were few engines he couldn’t fix. For years, Martin worked in various Chelsea garages and made service calls to all parts of the oil field. He operated his own machine shop as his last business before retirement. This picture is furnished by Martin’s son, Merlin Martin. ” I sure would like to know who those two fellows with Dad are. Maybe if we run the picture in the paper someone will identify them for us”, he commented.